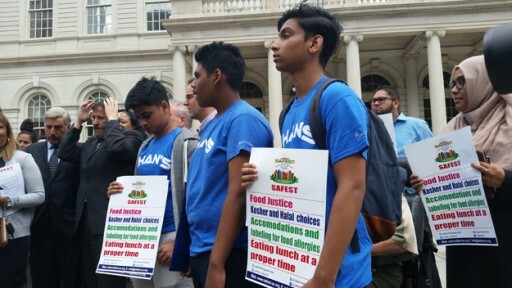 New York - Students in four New York City schools who adhere to kosher or halal diets will be the beneficiaries of a groundbreaking pilot program introduced by the City Council offering them free lunches during the upcoming school year. As previously reported on VIN News, Mayor Bill de Blasio kicked off the 2017 – 2018 school year with an announcement that all public school students would be eligible for free lunches, but no accommodations were made for students whose religion dictates to special dietary regions. The new initiative was announced tonight by Councilman Chaim Deutsch who has been advocating for the lunch program for more than three years. $1 million is being allocated for the pilot program which will be launched in September at two private schools, one Muslim and one Jewish, and two public schools, one with a large concentration of Muslim students and another with a large Jewish student population. Deutsch will be working closely with City Hall to work out the final details of the program in the upcoming weeks and hopes to have the lunch program rolled out for the start of the new school year in September. Several religious groups had clamored for greater inclusivity when Mayor de Blasio kicked off his universal lunch plan, but according to Deutsch, City Hall balked at the price of kosher school lunches, which are triple the price of the regular meals currently being served to public school students. Deutsch said the did not have an exact number at this time for the cost of halal meals. Determining which schools will be the beneficiaries of the program is no small task, noted Deutsch. Public schools could be selected by reaching out to organizations such as NCSY which work with Jewish public school students to ascertain which city schools have the largest populations of Jewish students, with a similar approach taken in the Muslim community. According to Deutsch, 115 of the approximately 450 private schools in New York City already qualify for federal funding for lunch programs that meets students’ religious needs because 62.3 percent of their students are eligible for the city’s SNAP food program. Deutsch said that schools that come close to, but do not meet, the 62.3 percent threshold could be considered for the pilot program. Having hit an impasse at previous attempts to craft a program with City Hall, Deutsch expressed his appreciation to City Council Speaker Corey Johnson for allocating funding for the program, as well as City Councilman Rafael Espinal for his efforts on behalf of the initiative. “Finally, Jewish kids in public school whose parents cannot afford to send them food will have kosher options, and yeshiva students will be eligible for meals like anyone else,” said Deutsch. Deutsch described the $1 million allocation as historic and said he hopes to be able to further expand the program in the future. It only took close to 200 years for NYC to make this option available to its students. While it is true that kosher lunch is expensive, think of all the tax dollars we pay that are not used to educate our kids who are in private school. All the cost of teachers, desks, etc that the city saves on...lunch is cheap by comparison! A nice gesture but I'm not sure there are many kashrut observant families with children in public schools. And given the kosher menu will be more limited, it's not likely to entice less-observant students into keeping kosher. Better to let the city subsidize private schools for the burden that is alleviated by avoiding public school enrollements.